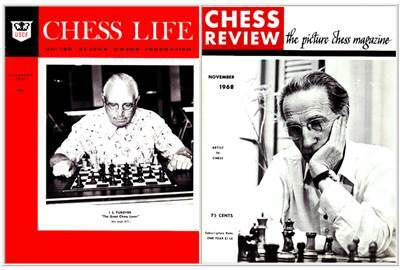 Chess magazine covers aren't reserved exclusively for World Champions and top grandmasters. Sometimes they feature prominent members of the B-team. Here we have two of them for the same month. Last month's October 1968 'On the Cover', featured a report by TD George Koltanowski on the 1968 U.S. Open. This month's cover led to a continuation of that report. The tale, omitted here, was a story about Turover meeting Alekhine and his wife. I.S. Turover was born in the same city as M. Najdorf, in [Warsaw] Poland, and came to New York in 1912, where he played in his first tournament in 1913. At 17, he won the Championship of Washington, D.C. He won it altogether three times, gaining permanent possession of the Washington Post Trophy, retiring undefeated in 1928! In business, he started as a jack-of-all-trades, and then started making good in the lumber business. Although he was blessed with success, he never forgot his great love: chess. Though well known in all charitable and civic circles as a great donor and supporter, he also supports chess. Only recently he participated in the sponsorship of Bobby Fischer's trip to the Natanya [Netanya] tournament in Israel, and he accompanied Bobby to the event. Marcel Duchamp died at 81 last October 1st, in Paris. In the art world, he became the "stormy petrel," much as Nimzovich had been in chess, taking a leading part in rebellion against established conventions and beliefs and in promoting the skeptical school of Dadaism. As of today, however, he holds a revered place as a prophet of and leader in most or the recent experiments in art forms. In consequence, his obituaries have been impressive and featured as front-page news in the papers. This Chess Review would be the first issue of the last 12 months of the publication's existence.